It's been four years since Uriah Heep put out their last album, Outsider. That album was met with initial excitement as they had been on a two album winning streak with Wake The Sleeper (2008) and Into The Wild (2011), and Outsider was produced by Mike Paxman like the two previous albums had been. Everything was in place to continue the artistic success. And, on the surface, that artistic success was continued. On the surface. But on further review (and many further spins of the disc) Outsider just didn't hold up as well as it's two predecessors. The production values were there, the Melodic Hard Rock With Class (as I like to describe it) was there, but the vocal melodies were often a bit cheesy, and even some of the music (mainly in verses, but also with a couple choruses) had more cheese than it should have. It just came across like a modern version of their mid 70's album, Wonderworld - an album that matched it's predecessors fairly closely stylistically, but just wasn't nearly as well written. So when the Heep announced they were working on a new album there was a bit of skepticism. Could they return to their Sea of Light/Wake The Sleeper/Into The Light form? Or would this be more like a modern Equator or Different World? Or, worse yet, would it be an even less inspired version of Outsider? The first sign that this album would, indeed, be a return to form was when they announced that Jay Ruston would be the album's producer. Ruston is a relatively young, fairly hot Hard Rock producer/engineer who has worked with artists/bands like Anthrax, The Winery Dogs, Steel Panther, and The Donnas, among many others. 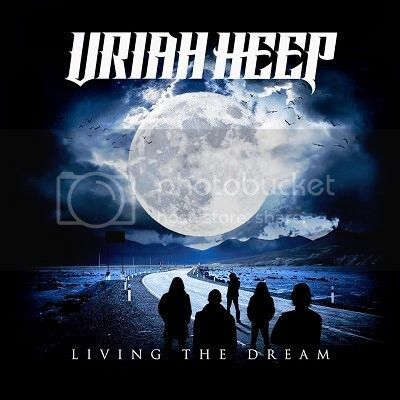 This seemed like an inspired choice for Uriah Heep if they were looking to get a fresh perspective on their music. And, as it turned out, it was a very inspired choice. Given Ruston's reputation as a recording and mixing engineer, it should come as no suprise that the album sounds great. That was expected. But what about the music? Outsider sounded great, too, and it was just an uninspired, so-so, OK album. Was Ruston able to deliver on the idea that he could help guide the five veterans in Uriah Heep through the process of song selection and editing/arranging their songs? He was, and very successfully, too. The album opens with a burst of energy that belies the ages of the band members. "Grazed By Heaven," is a fantastic upbeat song that sounds a lot like a hybrid of Perfect Strangers era Deep Purple and their recent Now What style combined with Into The Wild era uptempo Heep. This one was written by bass player Dave Rimmer and journeyman (and brief Journey Man) Jeff Scott Soto, and it fits the Heep style perfectly and is a great way to start the album (and was a great choice as lead single/video). From there the band gets a little more melodic and they slow the tempo way down for the album's title track. Musically, there is a lot of Steve Morse era Purple here (through a heavy Heep filter), while lyrically and vocally it is pure Uriah Heep. The vocal melodies and harmonies of the chorus are majestic - both beautiful and catchy. The song takes a bit of a turn like Book of Souls era Iron Maiden for the solo section before returning to the slower groove of the main parts of the song. To say this is a special song is an understatement. This is a modern Heep classic. "Take Away My Soul," sounds like Raging Silence era Heep re-written by the 2018 version of the group. An infectiously catchy chorus and a solid, melodic verse makes for another winner. This one has a good driving upper mid-tempo beat aside from the pre-chorus breakdown section (which is half tempo). This would have been probably the best or second best song on Outsider. On Living The Dream it's merely one of the 3 or 4 best (maybe even fifth best - the album is that strong). Never forgetting their flirtations with Progressive Rock in the 70's (and here and there in the 90's and 00's), they get back to that in, "Rocks In the Road," which starts and ends as a solid mid tempo stomper, while morphing into something progressive and dynamic. Tempo changes, mood changes, stylistic changes - this one's got it all. It's like a Uriah Heep take on some of the more ambitious songs on Iron Maiden's recent Book of Souls album. There's a real Purple-esque riff in the verse, and a bunch of stuff that recalls 70's Heep and even some 80's Yes. It's a fantastic song that a lot of long time Heep fans will appreciate. And then we get to, "Waters Flowin," a moody song that starts off with a relatively clean electric guitar overdubbed with acoustic guitar and some well placed piano. It's been compared by some to early 70's Crosby Stills and Nash, and that's not a bad comparison. But halfway through the song morphs into a fairly sophisticated power ballad keeping the same melodies and chorus hook, just adding drums, bass, and a distorted guitar. There is even a bit of The Cult's style audible in the backing music tracks for this part. It is a special song that really stands out on the album for all the right reasons. It's a great change of pace, and just a great song. "It's All Been Said," opens up as a fairly hard rocking Progressive song before shifting gears into a fairly gentle piano/bass/keyboard ballad before kicking back in to the hard rocking stuff. This diversity of style clearly recalls Uriah Heep's 70's albums where they could shift from Hard Rock to Adult Contemporary to Country Pop all on the same album. Upon first listen it seems like one of the weakest songs on the album, but the more you listen to it the better it gets. This is classic Heep stuff. Familiar with, "Radar Love?" Of course you are. "Goodbye To Innocence," is Uriah Heep's take on that kind of shuffle. It's a solid, well written, and well performed song. It's got a fairly high energy level, too. More interesting stuff kicks in with, "Falling Under Your Spell," which sounds like 70's Heep working with mid 70's Sweet. The chorus is Sweet, indeed, and in the best way possible. This is another special song that has a jungle drum kind of rhythm for the verse before jumping to that Heep/Sweet HUGELY melodic chorus melody and shuffle beat. There's a breakdown before the chorus that is pure 1970's Heep, vocally, too. A clear tip of the hat to the long time fans. The album closes with, "Dreams of Yesteryear," which is a slower midtempo song with some serious dynamics and melodies. Classy is a word that is sometimes used to describe modern Uriah Heep, and this song really mirrors that description closely. It's not a great song, but it's really good and the mood of the song is the perfect way to end the album. The chorus is, again, majestic and just feels good. So after the slight disappointment that was Outsider, Uriah Heep has come back strong with one of the best albums of their career. Everything works. There isn't a single dud on the album, and most of the songs are outstanding (the weakest ones are just good, and there are only two or three of those). Heep has done it again! Long may they continue to make albums like Living The Dream! In the words of the original Heep, Mick Box - 'Appy Days!